Endorsed with a cover blurb by Neil Gaiman. Sylvia Townsend Warner’s final collection of short stories was originally published in The New Yorker, and appeared in book form in 1977. This reprint brings these sixteen sly and enchanting stories of Elfindom to a new readership, and shows Warner’s mastery of realist fantasy that recalls the success of her first novel, the witchcraft classic Lolly Willowes (1926). 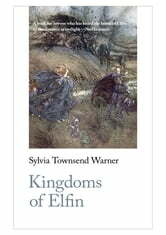 Warner explores the morals, domestic practices, politics and passions of the Kingdoms of Elfin by following their affairs with mortals, and their daring flights across the North Sea. The Kingdoms of Brocéliande in France, Zuy in the Low Countries, Gedanken in Austria and Blokula in Lappland entertain Ambassadors, hunt with wolves and rear changelings for the courtiers’ amusement. But love and hate strike at fairies of all ranks, as do poverty and the passions of the heart. Enter Elfindom with care. The Foreword is by the noted US fantasy author Greer Gilman, and the Introduction is by Ingrid Hotz-Davies. Warner (1893-1978) was one of the great 20th-century feminist modernist novelists, also a poet, a musicologist, and a Communist, and lived for most of her life in Dorset with her lover Valentine Ackland.